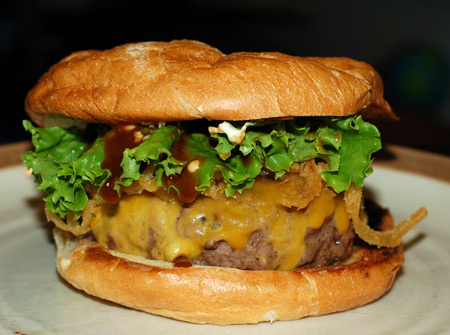 Every time we bring home ground beef, at least a portion of it just goes to making burgers. That means making a fresh batch of sandwich buns and some variation on your classic burger sides and fixings. 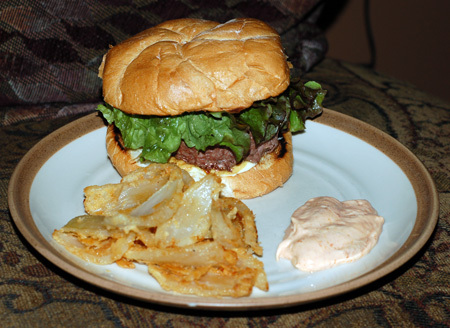 I’ve been gathering up these recipes for some time, but have never gotten around to posting them until now; there are so many options that I’ll split the subject over several posts, as burger-making opportunities arise this summer. For now, this post will focus on oniony sides, the first one being haystack onions. These can take the place of the canned French-fried onions in green bean casserole, serve as a burger topping a la Red Robin’s barbecue burger, or can simply be served in a big pile as an airy side or appetizer. Haystack onions are actually really easy to make, provided you have a food processor or mandoline to cut the onions very thinly and evenly. Slice about half a large sweet onion on your mandoline (or food processor, or cut paper-thin with a very steady hand) and toss it liberally with seasoned salt (we like the Penzey’s variety). Let it sit for at least 15 minutes while heating oil, shaping burger patties and whatnot, so that the salt has a chance to draw some moisture out of the onions. Dump the onions into a pad of paper towel and squeeze it to remove most of the excess moisture and some of the seasoned salt. Next, put then onions into a small Tupperware container or Ziploc with about half a cup of flour (I use white whole wheat or AP flour for this, but pretty much anything would work), seal it closed firmly, and shake it up until the onions are all coated well; the residual moisture will help it stick. Use a heavy saucepan or cast iron skillet to heat up about an inch of oil to 350F. You’ll know it’s hot enough when you drop a small pinch of flour in and get an immediate sizzle. Use tongs or a spider to lift a pile of floured onion out of the container, shake off the excess, and lower into the oil. Don’t overcrowd the skillet, as it will cause the oil temperature to drop. Fry for about 2-3 minutes or until light golden brown, turning partway through for even cooking; then remove promptly to a plate lined with paper towel. No need to salt these further, because the seasoned salt has already done its job. You can easily adjust the amount depending on what you plan to do with these onions, and you can fry up shallots the same way, though I’d go much lighter on the seasoned salt so as not to cover up the shallot flavor. I’ve made onion petals the same way, and served with a quick dipping sauce of mayo, ketchup, smoked paprika and a dash of cayenne. These were less successful, as the coating had a tendency to flake off. 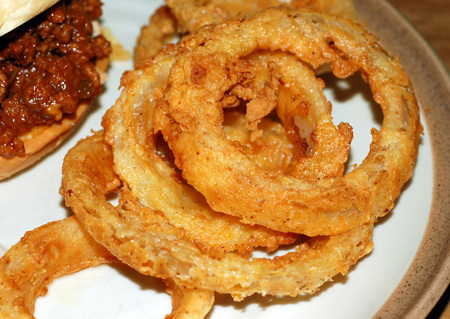 Much more successful were the onion rings I made last night to accompany some sloppy joes. I soaked 1/2″ rings in a mixture of plain yogurt and milk doctored with seasoned salt, then tossed them with flour and fried them up in the same fashion. They were crisp outside and tender inside, perfectly seasoned, and didn’t fall apart when you bit into them. My only complaint was that they were pretty greasy, but I blame myself because I didn’t have quite enough frying oil to regulate the temperature well. I kept them warm in the oven on a wire rack while finishing everything up, and served them with homemade yogurt ranch sauce for dipping. Peel the onion and slice crosswise into 1/2″-thick slices. Separate each slice into individual rings, and if possible, remove the papery thin membrane covering the inside of each ring. Put the buttermilk in a large baking dish and season liberally with season salt. 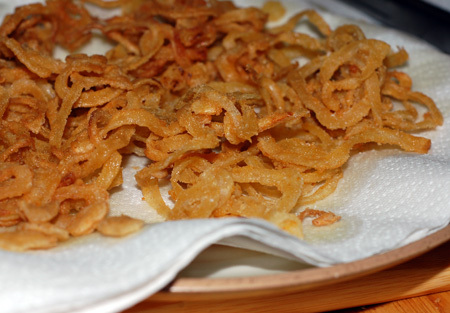 Submerge the onion rings and allow them to soak for at least 30 minutes. Meanwhile, place the flour in a large Ziploc bag or lidded plastic container, and season with garlic powder, paprika, cayenne, or any spices you like. (If you want to double-dip your rings for extra crunch, make up two of these containers. Heat enough oil in a large, heavy-bottomed medium stockpot or cast iron skillet over medium heat, or in a tabletop deep fryer, to 375 degrees F. Line a baking sheet with paper towels and set aside. Dredge the onion rings by dumping them into the flour container, closing it up, and shaking thoroughly. (If you are double-dredging your rings, remove all from the buttermilk to a separate plate, then dredge in batches, first in one flour container, back in the buttermilk, then into the second flour container) Tap off any excess and transfer a few coated rings, not more than 3 or 4 at once, to the hot oil. Fry the rings, turning once or twice, until golden brown and tender, about 4 minutes. Remove with a mesh skimmer and drain on a baking sheet lined with paper towels. Repeat until all of the rings have been cooked. Serve hot. Stir together all ingredients until smooth and uniform. Add a splash more or less liquid if you need to adjust the consistency, and adjust the balance of seasonings to your taste. Your buttermilk onion rings look divine and I have to make them for my onion-ring-loving husband next week. Thanks for the recipe!